In 1997 Rockstar published the first Grand Theft Auto game. That singular event secured the company and its games a reputation for brash social commentary and gratuitously violent gameplay that has lasted for just over twenty years. Each release in their flagship series was more bombastic than the last, with a unique appeal that helped make Grand Theft Auto 5 and its online component one of the most profitable titles to ever hit the market. 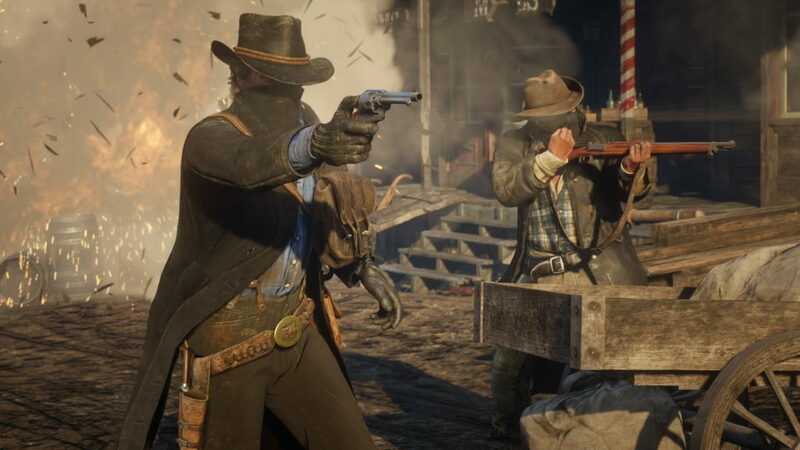 Perhaps the second most popular franchise in Rockstar’s stable is the Red Dead series; specifically Red Dead Redemption and its recently released prequel Red Dead Redemption 2. Rockstar’s games have a tendency to feature protagonists that have a morally dubious connection to the concepts of law and order. From Claude to CJ, to Max Payne and Trevor their characters are a true rogues gallery of lovable misfits. Yet no matter how unexpectedly endearing they may be, they all stand on one particular side of the law: the wrong one. No matter the intentions or reasons behind their actions, the consequences are negative for all concerned. Their actions are always criminal regardless of context, which is a huge factor in why Rockstar’s games are so successful. They give you a chance to see what life is like on the other side of the tracks and to have an uncanny amount of fun doing so. Arthur Morgan, the principle protagonist of Red Dead Redemption 2, is an entirely new breed of character for Rockstar. Although he and his criminal cohort extort, murder, rob, and con their way towards what they hope is a better life, the story goes to great lengths to emphasize the moral grey zone that they occupy. Far from being a world of clearly delineated right and wrong the narrative expertly highlights the fact that whether an action is good or evil is largely a question of perspective. Throughout the course of the game, players are given innumerable opportunities to choose how they act in any given situation and are required to make their choice sometimes within a set time limit, explicit or otherwise. Do you kill those rival gang members carrying out a coach robbery or let them go about their business? Do you save the injured woman at the side of the road or watch her die and loot her corpse? Do you beat a man to within an inch of his life for bumping into you in the street or do you let him walk on by without so much as a scuffing your chaps? On the surface of things it seems fairly obvious which is the good – or at least less malicious – option and which is the bad one. In-game reputation may be indicated along a sliding scale from dishonorable to honorable, but sometimes what seems to be the right choice often has unintended consequences, which neatly demonstrates the potential moral dilemma that we all face when deciding to obey or disobey the law. Every choice that Arthur does or does not make, and every crime he commits or prevents all intertwine to create a sub-narrative of moral quandaries determined by each individual player. In the end this reflects whether Arthur and the Van der Linde are set to meet a deservedly cruel fate, or if they are merely victims of a rapidly changing world as indifferent to their suffering as they often are to that of their victims. Perhaps the most telling example the game provides is the final sequence of the mission ‘Money Lending and Other Sins.’ At various points in each chapter, Arthur is sent to collect overdue debts from people who have fallen foul of Leopold Strauss, a particularly meticulous and unsympathetic loan shark. To begin with his assignments appear to be the legitimate collection of money from those who have approached the gang for funds to help deliver them from difficult circumstances. Arthur seems perfectly justified, if a little heavy-handed, in extracting payment for services rendered. 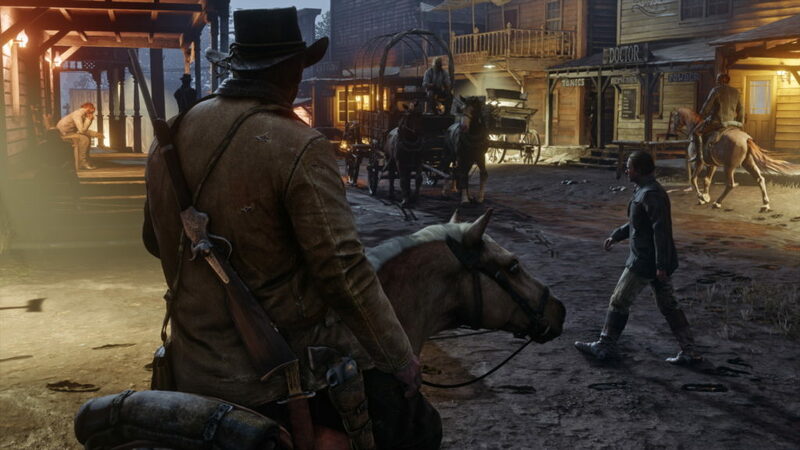 However, as the narrative progresses and the game draws to a close it becomes obvious that Herr Strauss has been sending Arthur to collect money from increasingly desperate and poverty-stricken people who have no ability to pay back what they owe. Their sorrow and anguish are the direct result of the powerful preying on the weak, a condition endemic in the vast majority of so-called modern civilization. As Arthur is forced to ponder the nature of his own mortality after a diagnosis of tuberculosis, it makes him realize that he has a willing participant in the destruction of so many lives, least of all his own, and that perhaps he isn’t the kind of man that he’d always considered himself to be. It’s a realization that we all come to at some point in our lives, but seeing it so starkly outlined in Red Dead Redemption 2 makes it clear that maybe we don’t always impact the world around us in quite the way we hope or intend. The impact that Arthur and the Van der Linde gang have on the world around them is questionable at best. The fictional states of New Hanover, Ambarino, Lemoyne, West Elizabeth, and New Austin that form the setting of the game are still being shaken by the last lingering seismic shocks of the exceptionally violent birth of America. They are ostensibly lands of peace and stability, protected and governed by the already mighty mechanisms of federal law. The old reality that Arthur and his partners in crime grew up in is rapidly being replaced by one in which true personal liberty is being forced aside to make room for enforced civic responsibility and economic interdependence. However, in reality they are just as roughshod and unpredictable as the true Old West, it’s simply the case that public perspectives have shifted. The philosophical opposition between pure, unadulterated self-serving mayhem and a more pseudo-philanthropic vigilantism is ultimately even reflected in the contrasting landscapes of the gameworld. On one side of the scale we have civilization and progress represented by the tangled alleys and industrial slums of Saint Denis, as well as the shifting slagheaps of the Annesburg mine and the dilapidated remnants of abandoned settlements. These are areas dominated by belching smokestacks and the relentless grinding of gears, and where industrial effluence can be seen frothing along the shoreline. Red Dead Redemption 2 is set in the year 1899, a good half century after the end of the Industrial Revolution, and the march of progress still ongoing to this day was by then well in its stride. At several points throughout the game, Arthur and others take brief moments to reflect on the nature of the social and environmental transformations they have witnessed. They are never regarded in a positive light when compared to the verdant pastures in the vicinity of Valentine or the largely still undisturbed forests of the East and West Grizzlies. These locations constitute a form of American pastoral idyll and represent all that was supposedly good and true about a way of life that was probably obsolete even at the time. Similar comment was made repeatedly during and after Britain’s own transition from a green and pleasant land to one of almost unparalleled squalor and misery during a period in history where industrial practices and economic policies failed to take into proper account the staggering impact they would have on the very essence of our lives. In Red Dead Redemption 2 the consequences of the failure of Manifest Destiny are all-too-clear to see, and the ideals that America was founded on have already been left far behind. Arthur’s nefarious background serves him well to begin with but as this new world continues to expand and develop, even his own brand of wanton criminality proves to be no match for the unstoppable onset of genuine modernity. Petty theft, usury, and even casual murder mark him out as a member of the old guard; one without the talents required for the mass exploitation of working citizens, insatiable corporate profiteering, widespread abuse of the natural environment, and wholesale governmental corruption. In comparison his undoubtedly extensive list of crimes seems rather quaint, fit more for charming folk tales of derring-do than for the rap sheet at the bottom of a wanted poster stuck on the wall of a saloon. You could conclude that their latest offering is another typically post-modern view at history through the lens of morally relativistic fiction, but with their latest release Rockstar have proven themselves capable of more than just the adolescent satire that their GTA titles are renowned for. Instead they have demonstrated that it is perfectly possible to make insightful and engaging social commentary without resorting to sneering and petty jibes. 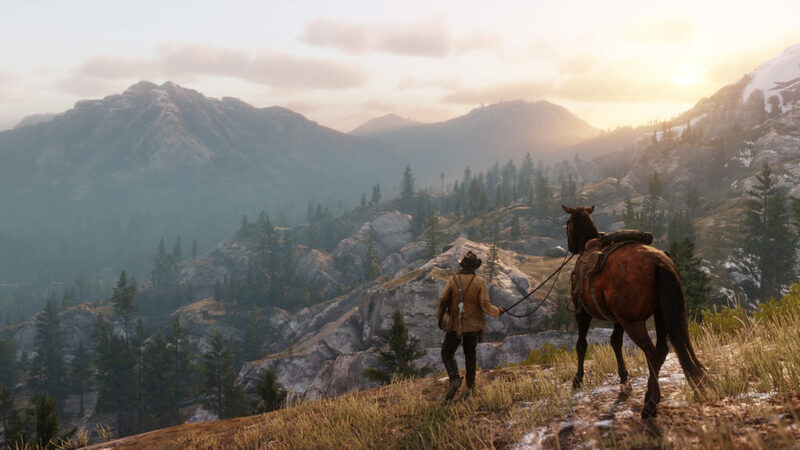 It is a lesson that few other developers have learned but one that thanks to the enormous critical, popular and commercial success of Red Dead Redemption 2, Rockstar find themselves in the unenviable position of being able to teach. Let’s just hope the class is paying attention.